While the last few years have seen women’s surfing progress exponentially in every area, from traditional logging to big wave charging, a look to the up and coming generation of female rippers suggests the future will be even brighter. One of the women leading the charge is Franke Harrer, who burst into the international conscious back in 2014 when Morgan Massen dropped a clip of her getting barrelled at Teahupo’o aged just 16. Then last year she lit up the internet once again, with another edit of her doing step offs on a solid day out at the Tahitian reef. However, a deeper look at the life of the 19-year-old from Malibu, reveals her big wave faculties are only a small part of her extensive arsenal. She’s 35th in the world on the QS, after landing two podium finishes this year, and she’s already laying the foundations for a fruitful modelling career. Hey Frankie, so tell us where you’re from, where you grew up, how you got into surfing and a little more about yourself? Hey! I grew up in Malibu, California with my three siblings. Both my parents are German and lived there up until my older brother was born, and then moved to LA for my dad’s work. We grew up speaking German at home, and spending most of our summers over there when we were kids. I got into surfing because my mom started a few years before I did when she was about 40, and pretty much become obsessed. I first started surfing on Kauai because we have a vacation house over there. We read that you are friends with and train with Laird Hamilton, how did that come about? Yeah, I’ve known Laird as long as I can remember because him and his family have always been family friends, because of us spending time on Kauai, and they live in Malibu half the year too. His training is amazing for surfing, so I’m super lucky that he lets me come up and learn! Three years ago you set the internet alight with that clip of you charging Teahupo’o when you were just 16, and then last year you went back there and towed it even bigger. Have you always been keen on bigger stuff? how did you get comfortable in waves of consequence? I’ll go! I think being comfortable in bigger waves is all about confidence in yourself, but also I know my limits. If it doesn’t feel right for me that day or whatever, I know that I have the choice not to go and there’s nothing wrong with that either! How did you end up getting into a couple on that big swell? I did step offs with Raimana, and I met him just through people at home because he comes to Malibu sometimes. The first time I did step offs was when I was 16, I didn’t even plan on going for that swell I just happened to be there, and he told me to come with him on the jetski haha. Earlier this month we saw you’d shredded your face, how did you manage that? I just got stitches on the top of my head. Nothing on my face luckily. I was doing a shoot at Teahupo’o. I was just too deep on one, and I ended up hitting my head on the reef. It seems like now is a pretty epic time for women’s big wave surfing, with speciality events and more role models than ever before. Do you have any aspirations in the big wave world? Yeah, it’s amazing how much a bunch of girls are pushing themselves in bigger waves these days for sure. I’d definitely like to try to surf some bigger waves when the opportunity is there! Frankie pulls in under a thick Tahitian lip. 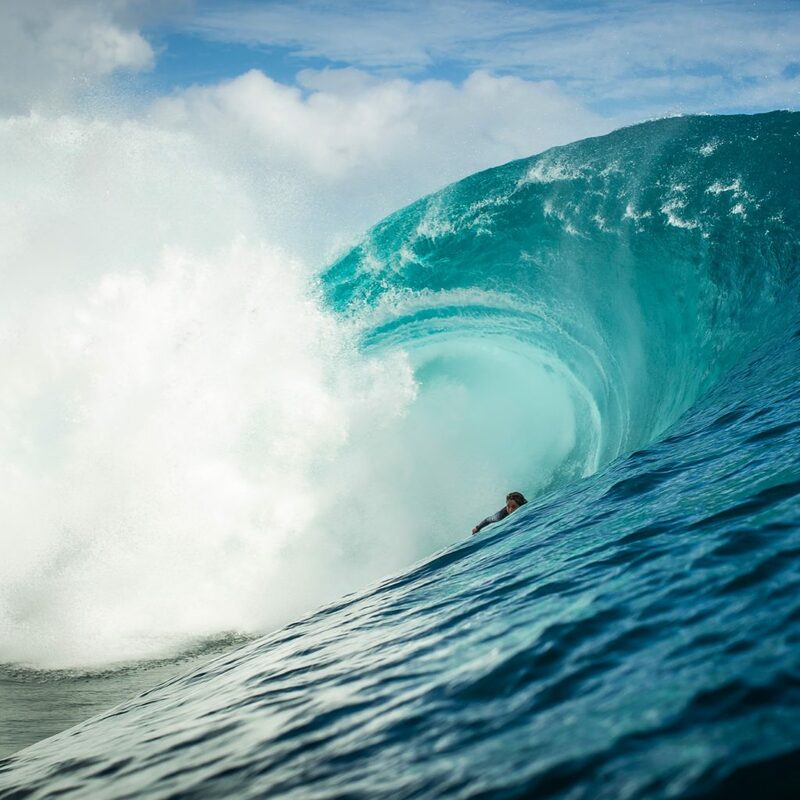 Photo Ben Thouard. When you Google your name the first two results that come up are ‘Frankie Harrer Went Towing At Teahupo’o’ and ‘Frankie Harrer’s Surfer Girl Beauty routine’. From your Instagram it also looks like you’ve done quite a bit of modelling. There aren’t too many women who charge heavy waves and also have modelling careers, is that a career path you’re keen to forge? I really like the fashion side of things too, and I’ve been getting more into it recently, so I think it’s cool to be able to mix them. I usually only do modelling stuff because of surfing, but I think it’s fun to do both! How do you respond to people who say that doing modelling makes people take you less seriously as an athlete? I think that it’s obviously important to choose the right shoots, and there is definitely somethings on the modelling side that aren’t taken very seriously, but for the most part I think that it’s pretty inaccurate to say that doing some shoots takes credit away from your athletic world. Thanks Frankie and good luck with the qualification campaign!